The Digiweigh OR-600 has a capacity of 600 grams and a readability of 0.1 gram. 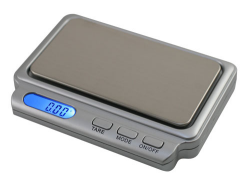 The OR seires is our slimest and most compact digital pocket scale. It features an ultra slim design and an auto off function for conserving battery life. Four unit modes include grams, ounces, grains and carats and the scales have a backlit LCD display.